Looking to create a ‘customer persona’ to inform your marketing and promotion and wondering how? This post may be helpful as it firstly provides an example and then lists some questions to consider as you formulate a description of your Bullseye customer. Starting Point : Who is the Customer? Any discussion of marketing starts with No.1 – The Customer on the basis that a business must have customers and provide a unique value to them in order to be profitable. Indeed, true insight of the customer must drive the approach to marketing that each business must adopt. For startups the starting point in terms of business strategy … a big phrase which I simplify as ‘deciding what does your business do and what does it NOT do’ … is agreeing who is the ideal target customer. I read an interesting example of customer descriptions in a Bord Bia document, ‘Irish Foodservice: Channel Insights November 2013‘. This post will now re-present the four consumer typologies developed following a RED C/Mintel survey of consumers. As regular readers of my posts know I am a big fan of Lean Startup particularly Ash Maurya but also Eric Ries. The starting point in filling out the Lean Canvas is to outline the ‘burning problem’ being solved for a particular niche of customers. In identifying customer groups it is important to analyse and distinguish between the Decision Maker, Budget Holder/ Purchaser, and the End User. For example, school books are purchased by parents for their children as probably stipulated or recommended by the school. So a product solution and the accompanying message must work on a number of levels. Therefore understanding the mindset and attitude of all the stakeholders is important. This type of ‘domain knowledge’ is developed over time which is why Steve Blank urges startup founders to ‘get out of the building’. The Bord Bia document, ‘Irish Foodservice: Channel Insights November 2013‘ seems to me to be a must read for anyone in the foodservice business. Combined the Quick Service Restaurant (QSR seems to be the new name for Fast Food) channel and Pubs, Cafes and Coffee Shops account for 69% of a market valued at €1.85 billion. The part of the Bord Bia report (pages 126 to 133) that caught my eye was the Customer Typologies – demographic characteristics and attitudes/ motivations. The service level in a food establishment is the primary motivating factor for choice of venue. These consumes expect a high service level as evident by food establishments with table service being their venue of choice. Over a third of All Rounders have visited every type of food outlet in the last three months and over 50% had been to an ethnic, American style and pizza/pasta restaurant in the same period. Over 34% of All Rounders have eaten in a work restaurant within this period, representing the highest consumer grouping that eat at their place of work. Eating out is an integral part of an All Rounders lifestyle. These consumers view food as an extension of their lifestyle and food is part of their social activities, with some 55% having purchased food at a sporting event/concert. All Rounders absence of dependents facilitates their above average spend on eating outside the home. The report concludes that ‘Bigger portions and online meal promotions are two motivating factors to further increase their engagement with differing foodservice channels’. So this is the one that really struck me as being very accurate. I could have said SNAP – and it was the inspiration for the title of this post. The report explains that fast food outlets are the most popular establishment with Kids Rule consumers (38% have visited a fast food outlet in the three month period ending in September 2013). 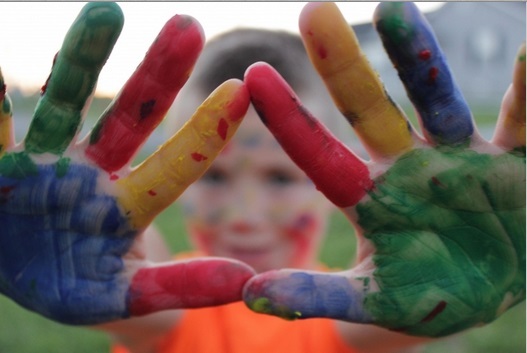 As the name suggests Kids Rule are consumers with children living in the household and as such their purchase decisions are driven by children. Decisions on where to eat outside the home are driven by suitability of venue for their children. The report finds that 61% of Kids Rule consumers stated the presence of kids‘ meal options on a menu was their primary motivating factor when looking at which venue to visit. Family orientated restaurants will have most appeal to this consumer grouping. Free Wi-Fi and larger portions were two secondary factors that influenced purchase decisions. 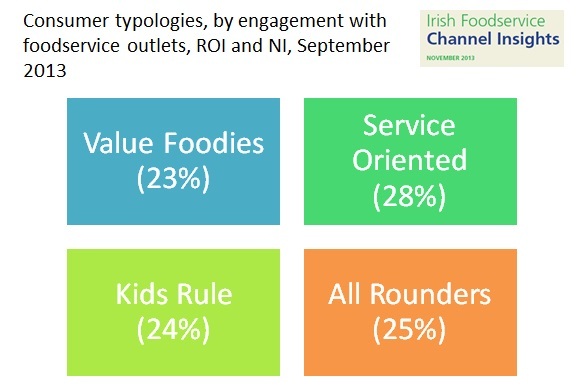 A quarter of Value Foodies have eaten in a table service restaurant, coffee shop/sandwich bar, pub or hotel in the three month period up to September 2013. Food establishments are a form of entertainment for Value Foodies and they place emphasis on helpful staff. Visibility of local produce is important to 76% of Value Foodies however, they do not expect to pay a premium for inclusion of local produce on a menu. These consumers are also health conscious and would like to see healthier choices on menus. The report adds that their price consciousness is evident as 45% of Value Foodies are motivated to visit an establishment by meal deal offerings that include a meal deal with food and drink. In addition, 40% of Value Foodies use online meal promotion websites and stated this was a motivating factor in their decision making process on where to eat out. This reflects their savvy nature and quest for a quality meal at an affordable price. If you are interested in more on Food Consumer Profiling here is a link to a pdf presentation entitled ‘Understanding Millennials for Better Connections‘ by Grace Binchy, Bord Bia Consumer Insight & Innovation as delivered at a Bord Bia Food Service seminar held in November 2014 – it is 159 quick slides and extremely interesting. In my training sessions, I assist and challenge participants to devise a Customer Persona by identifying their Bullseye Customer – a business could end up with a few such profiles. 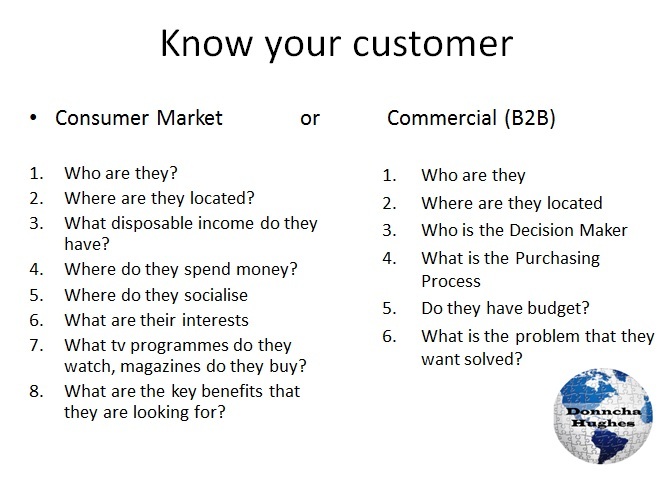 Here are the questions that I prompt business owners to answer as they formulate their customer descriptions. There is a brilliant post on Tweak Your Biz by Diarmuid O’Connell entitled ‘How to build Buyer Personas for use in your Marketing Communications?’ which outlines six steps on how to create the persona. It makes the point that when you fully understand your customer you will be a better position to communicate with them. I recently attended a workshop organised by Galway Rural Development on Farm Diversification. There was a presentation given by Brendan Allen of Castlemine Farm, Roscommon where he used the Business Model Canvas to introduce and explain their business. He talked about how he and his brother had deliberately changed their business by reference to every element of the canvas over a period of a few years.The change was prompted by a realisation that a normal farm of the size owned the family was not sustainable. The main reason being that they had no control of all the value creating building blocks of their canvas, namely: The Customer, the customer relationship, the product, and the value proposition. A farm owner is a price taker in a market dominated by processors and big retailers. They set out to change all these elements. Firstly the customer was no longer going to be the food processor but the end consumer and the chef. They have several customer groups, each of whom they understand intimately. Brendan presented a detailed but very concise description of each of their customer segments. The over-riding value shared by each group was a desire to buy consistently good quality farm produced food products. I was struck by the fact that Castlemine have found (and benefited from) an engrained desire by people in Dublin to buy directly from farmers. The end result speaks for itself … 12 people employed in a well managed, thriving enterprise. Lots of hard work! The moral of this story and this post is that understanding the customer and creating the persona is the crucial starting point in defining your strategy. My challenge to you is to craft a persona for each of your customer segments. I hope that you find this post useful as you set about this task! As always comments and social shares always welcome.